Washout first emerged during Gang War that tore apart Chicago, spending the conflict drinking in the Freak Outpost bar. He later swore his allegiance to the Vicious Circle and remained with the group from that point on. 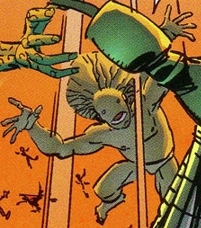 Washout was one of the dozens of villains that were shrunk down by a Martian weapon for a couple of years.He is later decapitated by Dart.